As 2018 draws to a close, it’s time to reflect on a year filled with great entertainment and recall what stood out and what will stay with us. This year everyone on the ComicBook.com team came together to nominate our favorite creators and creations in the worlds of comics, television, movies, games, and anime, then voted on five finalists in every category. The results are in, and they reflect some outstanding talent and a truly great year for pop culture. 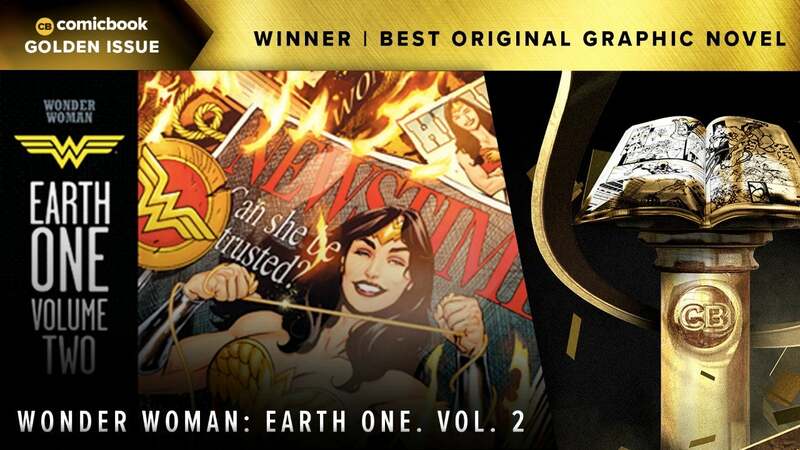 While many of our comics awards focus on ongoing series or miniseries, this one emphasizes the distinct publications released each year often referred to as "original graphic novels" or OGNs. Rather than focusing on serialized storytelling or maintaining readers on a monthly basis, they provide a single distinct story that's often the vision of a lone creator. These graphic novels highlight the greatest artistic achievements within the medium and what boundaries readers can expect to be pushed in the future. It is a category filled with truly great achievements, and that’s as true as ever in 2018. Wonder Woman: Earth One Vol. 2, by Grant Morrison and Yanick Paquette! Paquette's gorgeous artwork, which literally breaks the boundaries of its own panel layouts while also providing a structured, ordered reading experience, is the best of both worlds. He helps to rein in some of the wild madness that Grant Morrison can bring to a project -- especially one that centers on an "alien" culture such as Themyscira. Earth One Vol. 2 builds on the success of the first best-selling volume and asks questions about how a deeply patriarchal world would react to the sudden appearance of a character like Wonder Woman. It feels bigger and smarter than its predecessor, and manages to fill its pages with action and fast-paced thrills without becoming "just another superhero book." This was one of the most difficult categories to select nominees for, much less choose just one to represent the class. While Wonder Woman: Earth One Vol. 2 is a arguably the most accessible release in our nominations, the rest of the books on the list are fantastic works in their own right, and you will no doubt see many of them represented on "best of" lists throughout comics and literature criticism this year. My Heroes Have Always Been Junkies is a story of expectations and reality, with stunning visuals and a heartbreaking premise, On a Sunbeam is a riveting love story in space, and arguably Tillie Walden's best work yet, The Prince and the Dressmaker is a smart and charming tale about ambition and identity, and Why Art? is the latest in a long line of spectacular original graphic novels from Fantagraphics, exploring art and philosophy with tongue at least slightly in cheek in a way that feels of a piece with Scott McCloud's classic Understanding Comics. Checking out any of the comics on this list of nominees is highly recommended. Be sure to come back and check out the rest of the winners as they are announced throughout the week, then share your own favorite picks from 2018 in the comments.